Recently we talked about a last-minute person and an ahead-of-time person. 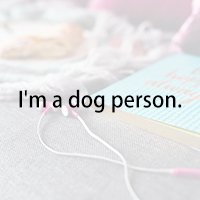 In English, the word “person” can be used to express personal characteristics or preferences. For example, if you love cats, you’re a cat person. If you prefer dogs, you’re a dog person. Personally, I love both cats and dogs, but I think I’m more of a dog person than a cat person. Let’s say, you’re invited to sushi lunch, but you don’t like sushi. Instead of saying “I don’t like sushi”, you can put it a little more elegantly by saying “Well, I’m not a big sushi person”. If you’re a morning person, you wake up early, feel more productive and clear-headed during the day. If you work better at night, you’re a night owl. 1. you’re like a dog. 3. you like a dog.